With fall just around the corner, you may be looking for Halloween or other seasonal stories to share with your children. 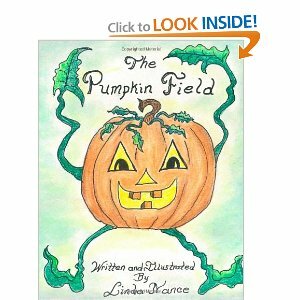 A great one to consider is Linda Nance’s “The Pumpkin Field”. This picture book was both written and illustrated by Linda, and she is certainly one gifted storyteller. So what is “The Pumpkin Field” about? It is a catchy little rhyming story that brings out the best and spookiest parts of autumn. From the bare, skeletal trees to the black cats, magical scarecrows and spooky witches, this story literally has it all. And of course, there are lots of pumpkins to be found as well! I know it can be hard to pick just the right kind of spooky, but not-too-scary book for your kids. This one has an edge of fright, just enough to give you a little shiver, but is certainly not violent or terrifying. Even the smallest ears will be fine listening to this little tale. The pictures that accompany the story are well-drawn, but definitely have a handmade feel to them. No computer generated graphics here! However, I find this style of art quite charming and a welcome change from the overly digitized picture books that are often produced today. Art like this has a homey feel to it, one that makes you want to curl up with a blanket in front of the fireplace and get lost in the story. If you would like to consider adding this book to your Halloween collection, you might want to visit the book’s Amazon page or Linda Nance’s blog. < Picture Book Giveaway! Make sure you enter! Hey! Your site looks awesome! I read your review of “The Pumpkin Field” and it sounds very well done – I’m in that autumnal mindset myself. If you enjoyed “The Pumpkin Field,” you’d also like this book I discovered. Do Spiders Need Leggins When It’s Cold Outside? by Terri Sebastian, a bedtime story book full of silly sayings, mysterious nighttime noises, and curious life questions. Along with the spider that needs leggins, author Terri Sebastian introduces readers to a silly old polka dot cat, a lady moose all dressed in red, and the pirate that lives in a closet inside a shoe with his crewmate, a little brown mouse. Each story in this book is inspired by childhood questions posed by Terri’s son, Ryan. After Ryan died just before his 16th birthday, Terri decided to publish a collection of his stories to honor him. Now, Ryan’s memory is carried on not only by this book and these stories, but also by the five people whose lives he saved by being an organ donor. Wow, that is an incredible story! I will definitely have to read that book! I am so happy Ryan’s parents were able to bring some good out of a tragic situation. Thanks so much for reading my blog and for telling me about this awesome book!